Boomerang is a free addon for both Firefox and Google chrome which allows you to schedule you Gmail messages to be sent later. With Boomerang addon, you can write an email now and schedule it for the future. Boomerang is a plugin that fits beautifully into the default Gmail UI. The plugin is also available for the smartphone like iOS, Android and Blackberry, you can try the app on your smartphone by going to this link m.boomeranggmail.com from your mobile device. The best thing we like about this application is that its easy to use and takes a minute to setup it witj your Gmail account and very easy to use, just write mail and hit the send later button. To use Boomerang on you Gmail inbox, you need to give the service access to your Gmail account. So here are the steps which allows you to install Boomerang on your Firefox and Google Chrome browser. Step 1. Install the Boomerang Plugin addon on your Firefox or Google chrome browser. Step 2. Once the Plugin is installed on your favorite Browser. 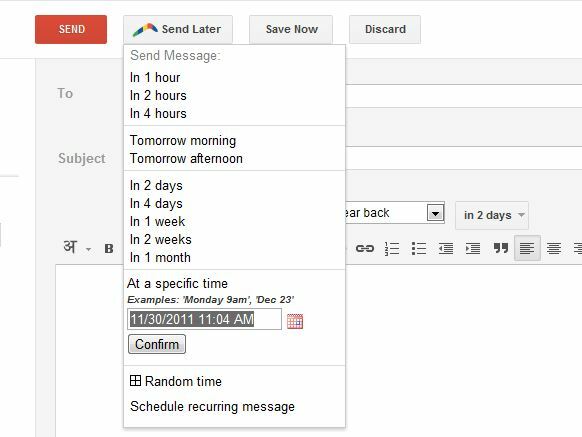 Reload the GMail to see the new Send later option on your Gmail inbox. If you still can’t see the option then restart the browser. Step 3. Now you can see the Send Later Button next to send button on your Gmail Compose message window, You will need to authenticate, so make sure that you permit pop-ups, at least this once. Step 4. Select the time you want to send the message from the drop-down menu or you can even enter your date in normal language; Boomerang will understand phrases such as Tomorrow at 12PM or Next week. Click Confirm when you’ve entered the time you want. That,s it now you are ready to schedule your Gmail messages for future. But remember Boomerang allows 10 free scheduled e-mails per month and requires a subscription beyond that. Will this add-on work if I sign out from Gmail? I mean do I have reamin logged-in so that email can send at schedule time.